Would you like to know what you can do to increase your LinkedIn InMail response rate? I have a couple of powerful ideas to share, but you might be disappointed by this post if you’re expecting a cookie-cutter article with the familiar advice everyone gives for increasing their messaging response rate – InMail or otherwise. This isn’t a “Top 5 Tips to Improve your InMail Response” article with a “recipe for success” – if that’s what you’re looking for, don’t bother reading any further. You won’t be getting any one-liners or script ideas from me. If you’re looking to ponder a bit on the mysteries of why people who aren’t looking for a job might respond to a recruiter, then read on. 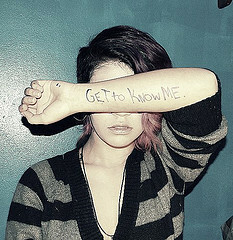 How Do People Feel About Being Approached by Recruiters on LinkedIn? Some of you may recall a LinkedIn blog post back in January of 2011 that featured the results of a LinkedIn poll titled “Does a recruiter approaching you unsolicited on Linkedin bother you?” that received nearly 14,000 responses and over 1,500 comments. 47% of the respondents claimed that being approached by recruiters on LinkedIn doesn’t bother them at all. Of course, that doesn’t mean that they will respond – just that they aren’t annoyed. 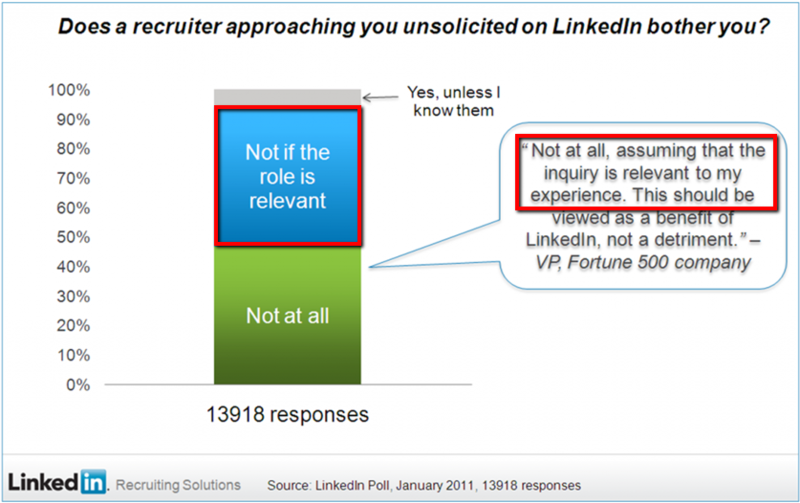 More interestingly, 48% claimed that they did not mind being approached unsolicited on LinkedIn, provided the role is relevant. Again, not minding is not synonymous with earning a response. Now, it should not be surprising that the majority of those who responded would be bothered by recruiters reaching out to them unsolicited regarding opportunities that are irrelevant to them. So How Do You Know What’s Relevant to Someone? If you’re any good, you’ve done your research on the person you’re sending an InMail to. You should have a sense that that your opportunity could at the very least be a logical next step for them based on their career progression, and you should be able to explain such in your InMail by clearly calling out what you see in their work history that leads you to believe so. That’s assuming of course that you have some idea of their career progression – which isn’t always easily accomplished. Many people do not have a fully filled out LinkedIn profile, nor does everyone have a decent “digital footprint” online anywhere to be found or pieced together. If all you have is a title, a company and some basic information on someone, you’re making a pretty big assumption about someone if you think you know what they would consider to be a relevant opportunity. Even if you have full resume-level detail on a person, you have to be aware that each person in your search results that you might send an InMail to can have a completely different idea of what they would consider to be a relevant opportunity to them, regardless of title and experience. The reality is, no matter how much detail you have on someone, you really don’t know what they’d be interested in making a move for. Instead of being wildly presumptuous and assuming you have an awesome/great/wonderful opportunity for every person you send an InMail to, why not simply recognize that fact in your messages – that until you to establish 2-way communication with someone, you really don’t know. I really don’t care what it sounds like – I know it works. Do you know why it works? Let’s say you aren’t looking to make a move from your current employer – you’re so not looking that it’s never even crossed your mind (if it had, you might slip into the “passive” category). Let’s say you get a few InMails from recruiters every week. What would make you respond to one of the InMails? If you can answer that question, and then craft that approach into your InMails and any other messaging efforts for that matter, you will get a higher response rate. That’s exactly what I did, long before LinkedIn was even a glimmer in Reid Hoffman’s eye. Back in 1997 – about 3 to 4 months after I started my career in recruiting – I asked myself that exact question…if I wasn’t looking for a job, why would I bother to respond to any recruiter? I’d say that at least 70% of the people I would call and send messages to back then were not actively looking to make a change from their current employer. In order to be successful in a small agency environment, I had to find a way to get more people to respond to my messaging efforts – especially the people who typically would not respond to most recruiters. I found that when I simply recognized that I needed to involve the people I was trying to reach in the process of deciding what the next step in their career looked like, instead of assuming that the positions I was recruiting for were great opportunities for them, I started to get a very high response rate. You do know that when you send messages about “great opportunities” to people who aren’t actively looking for a job that it can come across as a little ridiculous, don’t you? You think your opportunity is great because it’s your job to fill, and there might even be real reasons why it’s so “great,” but it’s ridiculous to assume that what you think it a great opportunity is what they would deem a great opportunity for them. It’s actually sales/recruiting success 101– you need to identify the need before you can fill the need. I know some people are probably reading this post and wanting me to just give them “the answer.” I actually already have – it just might not be in the form you’re expecting. There is no script or combination of sentences you can copy and paste to get a higher response rate to your LinkedIn Inmails or any other messaging, for that matter. If you want a list of ideas for InMail success – here are 6 tips to boost your InMail response rate– sound advice, to be sure. Shorter is not necessarily better. Many people assume that people who aren’t looking for a job won’t take the time to read through a longer InMail. Here we go with the assumptions again. I’ve found that longer messaging gets higher response rates. Do you have any ideas why longer messages might get a higher response than shorter messages? Unless you aren’t interested in potentially recruiting the person you are InMailing, asking for referrals in your first InMail can seem like a “drive by” attempt and that your interest in that specific person isn’t very genuine. Bulk messaging is fine for getting the word out that you’re hiring for a particular opportunity, but if you are looking to recruit specific individuals, do not send bulk InMails. Period. I believe the real magic of getting a higher response rate, especially from passive and non job seekers, is to not assume you know what would be a relevant opportunity for someone based off of their LinkedIn profile or any mix of information you can piece together on someone you’re sending an InMail to. Your opportunity might in fact be a great move for them, but until you connect with them and find out exactly what they would consider to be a “great opportunity,” don’t be presumptuous. The value you provide as a recruiter isn’t the job you’re recruiting for – it’s making the right match. And you can’t even begin to make the right match until you take the time to find out what each person’s right match is. If there is any “answer” to getting an exceptionally high response rate to your InMails, it would be derived from the answer to the question of why someone who isn’t looking would bother to respond to a recruiter.